The vertical drop from summit to base is 1188 ft. The average difference in altitude between base and summit of Ski Resorts in Italy is 3087 ft. Runs and slopes are therefore relatively short. The ski resort takes you to an elevation of 6129 ft. Season starts on Dec 17 and ends on Apr 2 (106 days). Average season duration in Italy is 130 days. Average snow depth during the season (Dec 17 to Apr 2) is 20 " at summit elevation and 9 " at base elevation. Snow coverage is usually best during March, offering an average snow depth of 28 " at summit elevation and 11 " at the base. Monte Terminillo features 70 sunny days on average per season. The average for all ski Resorts in Italy is 71 sunny days. March is the sunniest month with an average of 25 sunny days. 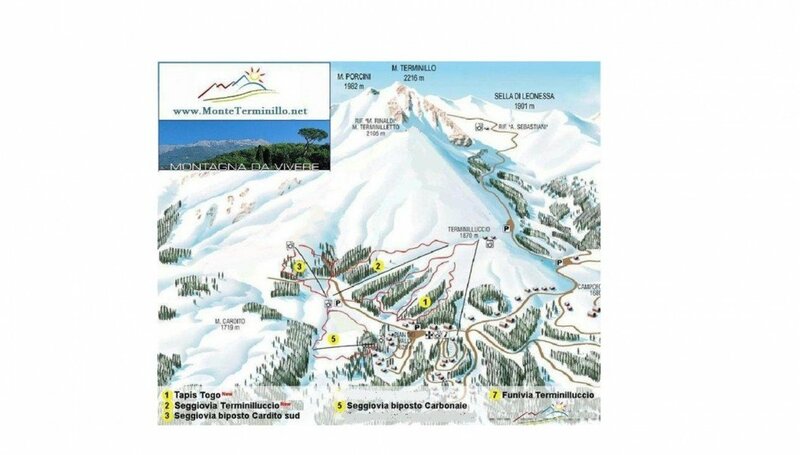 Monte Terminello is a great ski resort with a total of 45km of nicely groomed slopes. The mountain is a part of the Monti Reatini massif in the Abruzzese Apennines that is located in the center part of Italy. The slopes vary in ability levels with a focus on intermediate trails, but the steeps are also very challenging and a treat for expert skiers. The infrastructure of the mountain includes several high-speed lifts and it makes Monte Terminello really easy to get around. The resort is family friendly and makes for a great destination for your wintesports vacation this season.